I have been digging and weeding like a demon trying to get the ground ready for planting – just as soon as spring returns (it is currently -4 degrees!). Our house is built on the site of an old Victorian greenhouse which was demolished in the late 1980’s. The ground is full of smashed glass which we are always digging up. However, the other thing we keep coming across is bits of blue and white pottery. No matter where I have lived this seems to be a common occurrence and I started wondering where does it come from and why? First port of call for any serious research – Google, of course. However, there is surprisingly little information on the world wide web about this phenomenon. The only theory I could find is that in Victorian times the willow pattern was produced by every major pottery producer. It was produced on such a mass scale it was affordable to almost every Victorian household. So how did it end up in gardens? Broken plates would be used as drainage in the bottom of pots in the garden and eventually contents would be tipped into the garden and ultimately buried…only to be dug up again in the 21st Century! So in true Victorian spirit I will collect all the pieces of pottery I find and use them for drainage in my pots. Extreme recycling! This entry was posted in General and tagged blue and white pottery, digging, gardening, pottery, Victorians, weeding. Bookmark the permalink. How interesting that the pottery was used for drainage. Wonderful to continue the tradition. Thanks. I hope you took the metal to the scrap merchant and bought lots of seeds with the profits! It was no good, it was all rusted and horrible! the reminence of an air raid shelter from the war I should aspect! 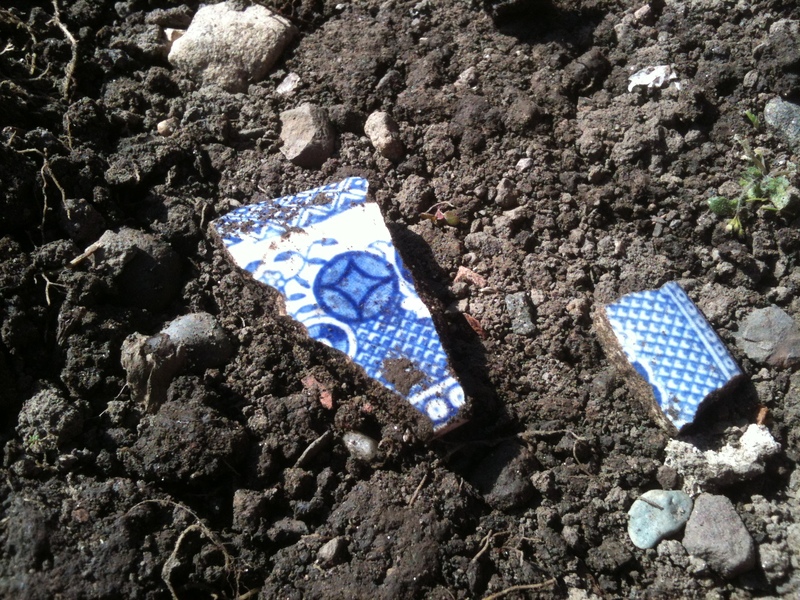 I came across your site as I spent yesterday with my niece digging up pieces of blue and white pottery from what used to be my grandmother’s garden. My sister and her family live there now. When I was little, I used to spend hours in the same garden looking for pieces and my mum did the same when she was small. There must be loads of it!! Or maybe the same pieces got thrown back into the garden and we’re just unearthing the same bits over and over again!!. Fascinating stuff!